Tonight's guest review is from Shaun Hilmar - take it away, Shaun! Well, it’s been another year of the superhero blockbuster. The Avengers, Dark Knight Rises and the Amazing Spiderman. And of course with the films comes the anticipated avalanche of movie merchandising. Some were great, others….not so much. 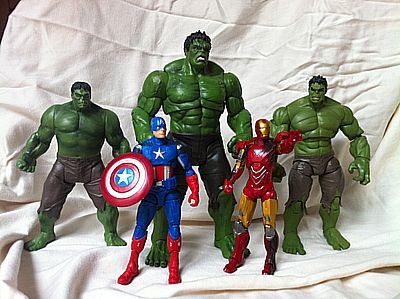 Tonight, I’m checking out a character from the Avengers, one who, despite only appearing twice in the film, seems to have been a clear fan favorite, providing a great blend of ferocity and humor….The Hulk. While we’ve seen the lion’s share of this character produced in plastic by Hasbro, I’ll be looking at the Diamond Select Toys version. 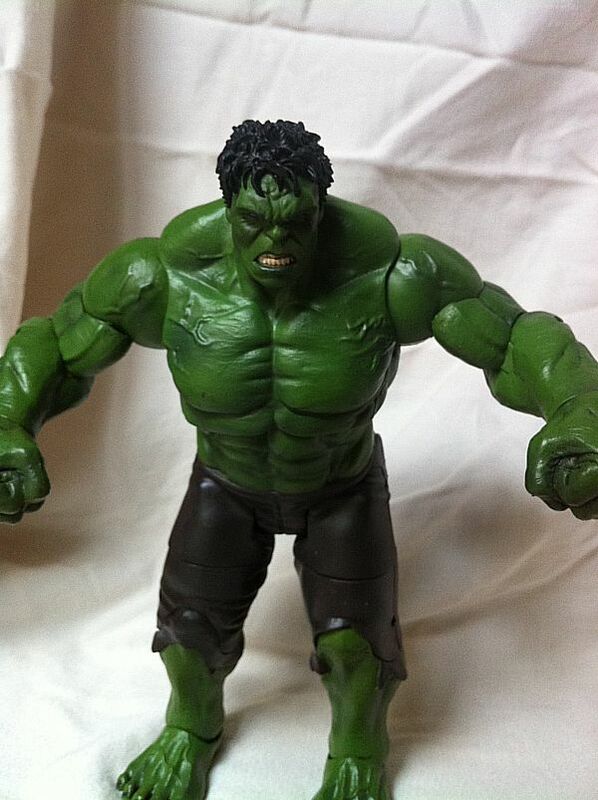 While the Walmart exclusive movie series Hulk is proving to be quite a challenge to come by, this guy can be had at most online retailers as well as local comic/collectible shops. If you are familiar with previous DST Marvel Select Packaging, then you basically know exactly what you are getting here. It’s a large card back/bubble style adored with various images of the Hulk as well as character info provided on the back panel. I like it personally, as it does a great job of showing the figure, it’s colorful and best of all there is little, if any, waste. Unfortunately, the package isn’t what you’d consider collector friendly, as the bubble is glued to the card back at all sides. As a result, it will have to be cut or torn to free the figure and molding tray that holds him in place. 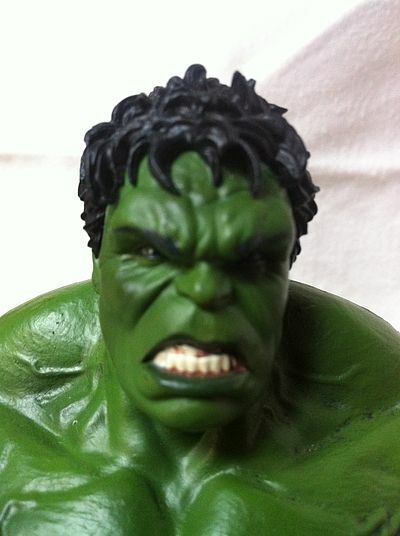 Mark Ruffalo was used as the basis of the appearance of the Hulk in the film and of course, and figure produced should try to capture that look. There will be a lot of debate among fans, no doubt, whether the various figures produced accomplish this and this figure is no exception. This guy is big too, coming in around 10 � inches, and he’s solid and heavy. Only his abdomen and pelvis (one piece) are actually hollow. For my money, the face looks great. Not entirely sold on it being Ruffalos Hulk, but I do see him there. The expression they gave him is what really does it, this semi-snarl about to break into a ground trembling roar. The teeth, angles of the muscle in the face are all there and look great. It should also be noted that the hair on this figure is a separate sculpted piece and is very well done. Moving into the torso and arms, you have all the bulging muscles complete with rippling and veins protruding. Pretty standard fare for the Hulk. It looks great and is done well. 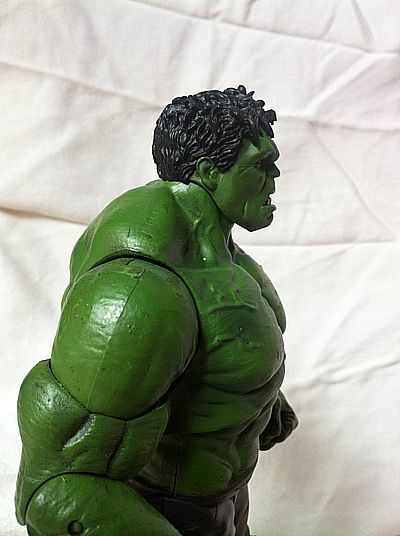 The only criticism I have is that it may be a little over done as I didn’t feel the Hulk in the film had quite this much definition, but this in no way detracts from the great look of this figure. I do have two big issues regarding this category, however. One, is the decision to utilize closed fists on both hands. I know that’s simply a personal preference, but for me, I’d have liked to have seen one hand open. Two, is the lack of any real detail on his pants. 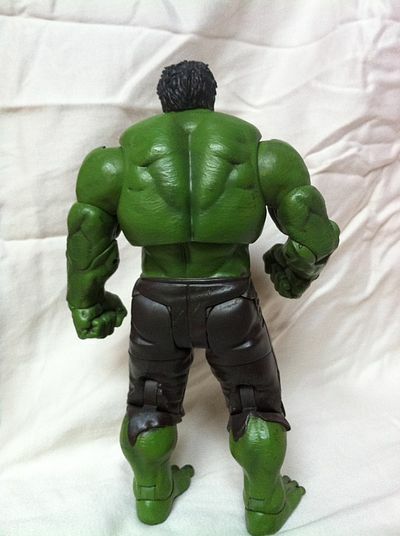 I know he’s the Hulk and I know he tears his pants up every time he blows his stack but to not have some seams, pockets, zipper….if there’s any part of this figure that feels phoned in, this is it. Below the torn pants, the lower legs and feet are well done, and look great. 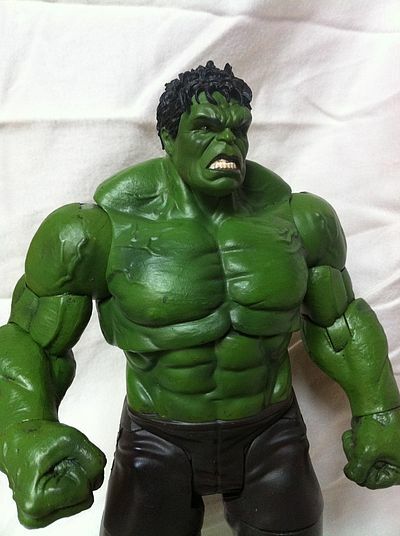 The Hulk is one of those characters that paint tends to be pretty simple, but don’t think that it can’t be messed up. Fortunately, DST did a good job with what was needed. I like the green, however, I feel it’s maybe a shade too dark compared to the film version it’s based on. Additionally, we get a nice wash over the skin, that isn’t overdone, thankfully! It’s just enough to accent the muscles and help with definition. The pants are a flat dark color, I believe the second pair he wore in the final battle, I could be mistaken. In the detail work, I found little slop and clean lines, particularly in the face, i.e. the eyes and mouth. The white teeth and even a bit of gum line combined with the sculpted set jaw look great. I counted 17 points of articulation on the Hulk. A ball jointed neck that has good side to side movement but not great up in down due to the large neck (or lack thereof). There are ball joints at the shoulders, swivel biceps, hinged elbows and cut joints at the wrists. While there’s no cut waist, he does have a ball/diaphragm type joint mid abdomen allowing him to move his upper body side to side and back to front. 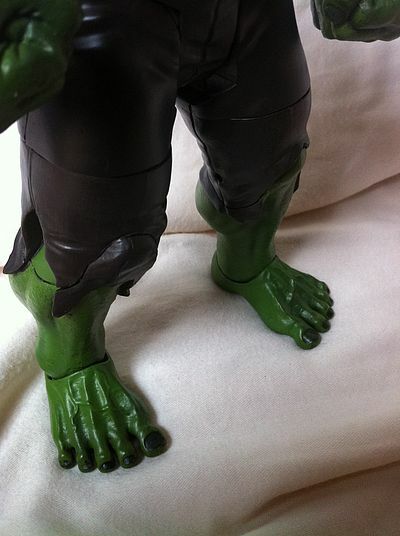 Moving further south, he features what appears to be DCUC inspired T-joint hips,cut thighs, hinge knees and finally rocker type ankles, similar to what Hasbro is using on a lot of its figures in place of the previously used ball joint. 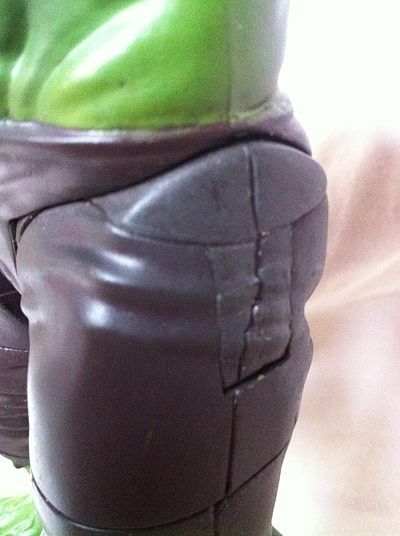 Unfortunately, any real issues Hulk has are below the waist line. It’s the T-joint. I was always a little lukewarm on the ball jointed hips on a lot figures. They were often frozen, and/or stuck out and looked odd. When I saw this figure featuring the T joint style, I was elated. Upon removing him from his package, I noticed immediately, his left leg was super loose at the hip. As I began working the various joints, I noticed that DST included ratcheting type movement on some of the key joints, in particular, the knees and hips. That’s great due to the weight of this guy. Trouble is, I noticed that if one was a bit over zealous with the outward or side movement of the hip, the resistance of the ratcheting feature could put undue strain on the post going into his pelvis and snap it. I did look at this online and discovered many people noticed the same thing….and strangely, always the figures left leg. Maybe DST will get wind and tighten up the tolerances a bit. No stand. 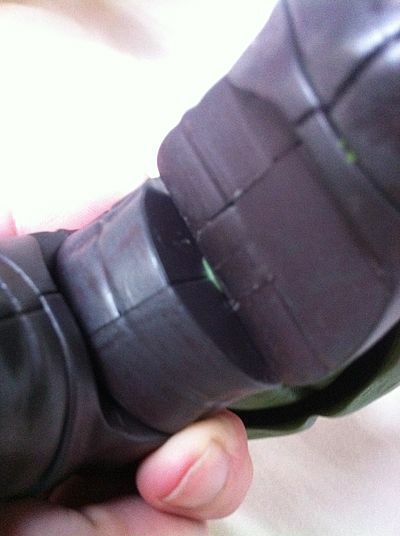 No portion of a smashed wall, or boulder that you may find included with Hulk figures are present here. This figure can be had from most online retailers and even a lot of local comic shops. The price seems to range anywhere from $19.99 to $24.99. I paid about $21 for him and to me, that’s a great value, considering 3 � figures are $10 now and a lot of 6-7 inch are in the $15-$20 dollar range (mass market, of course). While he doesn’t come with any accessories, the sculpt, paint, size and smaller production run more than make up for it. 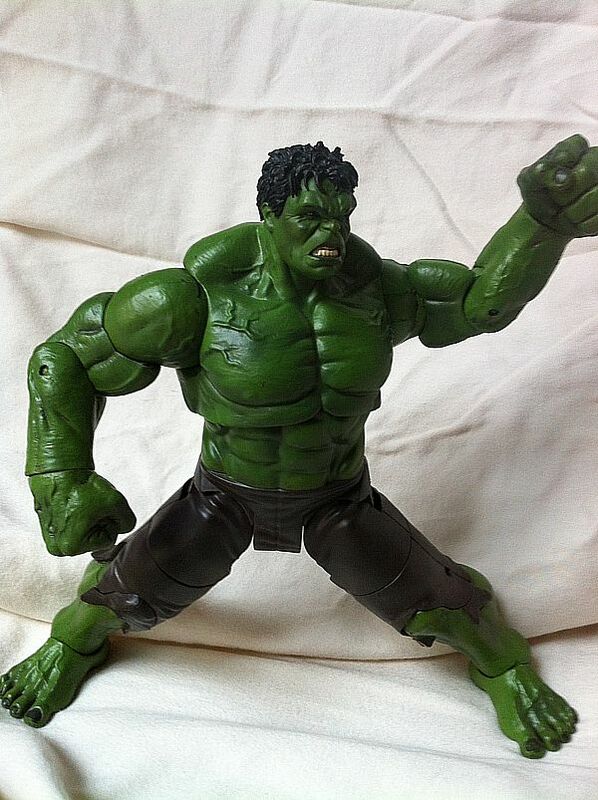 We’ve gotten a lot of Hulk figures, both movie and comic inspired over the years and this guy is a great addition. He’s large and sturdy with good articulation that the kids are sure to love. All the while, he has enough going on in the sculpt and paint department to keep us older folks happy as a display. 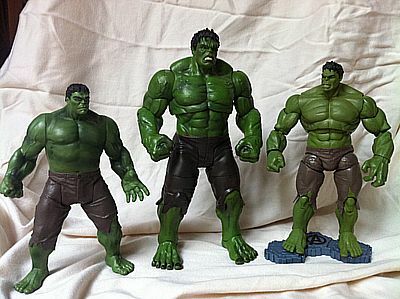 In fact I know many people substituted this guy in with the Hasbro Movie Series figures believing him to be a better fit, scale wise, than the difficult to come by Hasbro Movie Series Hulk. When this guy first appeared I knew I had to have him, as a collector of Hulk figures and a huge fan of the character, I’m not disappointed. As good as he looks online and in pictures, he’s that much better in hand. I say, without reservation, if not for the hip issue, he’d be a 4 star Hulk figure in my book, particularly at the price point. He holds poses very well and for collectors, you’ll have a lot of options for the shelf. 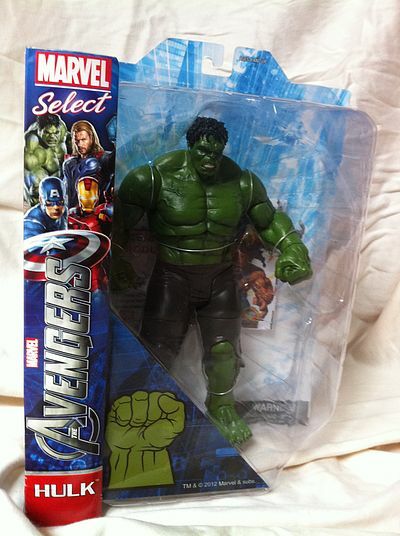 The kids will love him, particularly if they like the character and are into the Avengers, and have parents who are unwilling to constantly comb Walmart stores looking for the short packed Hasbro Hulk. This guy makes a great option. Depending on who you are, maybe a better one. Most online retailers still have this guy for under $25. Local comic shops are also a possibility. This product was purchased for the review by the reviewer. Photos and text by Shaun Hilmar.